Once you've qualified a sales lead, HubSpot will allow you to create a Deal to indicate and track the revenue opportunity. 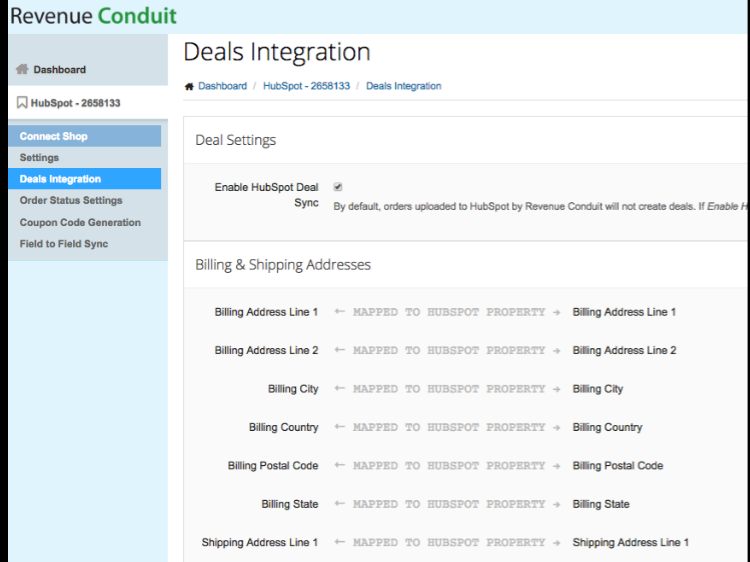 With the Revenue Conduit, you can have your deals automatically mapped for you with the different order status settings. HubSpot Deal Record Sync is a Revenue Conduit feature that's available to our higher volume subscribers on the Growth package or above. If you need to upgrade your plan Growth or higher to enable this feature, please contact support@revenueconduit.com with your upgrade request and we will be happy to implement this for you. We recommend creating a custom Deals Pipeline that's specific to your Shopping Cart. We have an example of a custom pipeline below, for WooCommerce. 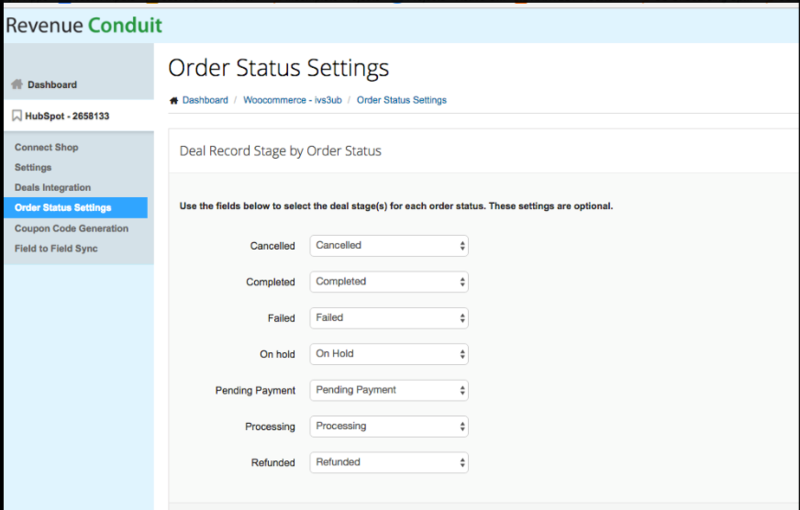 You can create a Deals Pipeline with only 1 Deal Stage and map all of the orders Revenue Conduit syncs to that single deal stage, or you could create 2-3 custom stages in your custom Deals Pipeline, or you can create a Deals Pipeline with a Deal Stage for each of your order statuses, as demonstrated, below. 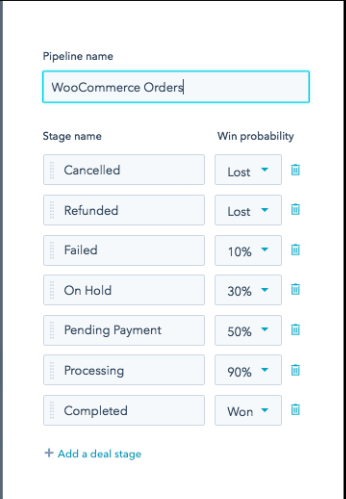 Every E-commerce Platform has varying Order Status Types; Below is an example order status list for all Woocommerce subscribers (this may vary slightly from cart to cart but essentially will be about the same for everyone) along with the recommended probability percentage for each status type. Below is an example Deal Record Stage in Revenue Conduit under the Order Status Setting section: for this example we are using the same Woocommerce subscriber as previously mentioned. If you would like to include these Order Status's as part of the Deals in HubSpot you would need to complete the following tasks. 1). Once we have confirmed that we have enabled Deals for you, please Login to the Revenue Conduit admin portal and select HubSpot. 3). For each Order Status Type, you will need to map the appropriate HubSpot deal that you would like synced. For ex: Cancelled you would most likely want to map as a 'Closed Lost" whereas, Completed, would get mapped as a "Closed Won". 4). If you do not see the field that you would like Revenue Conduit to map in the available dropdown, then you can add the Deal Stage to HubSpot directly and then re-log into Revenue Conduit admin portal to map the field afterwards.